It is a staple of every high school and college science class. Its familiar shape has stayed largely the same since 1869, when Siberian chemistry professor Dmitry Ivanovich Mendeleev first grouped chemicals together according to similar properties. It is indispensable to scientists of all disciplines, and has even inspired our very own ScriptPhD.com logo! 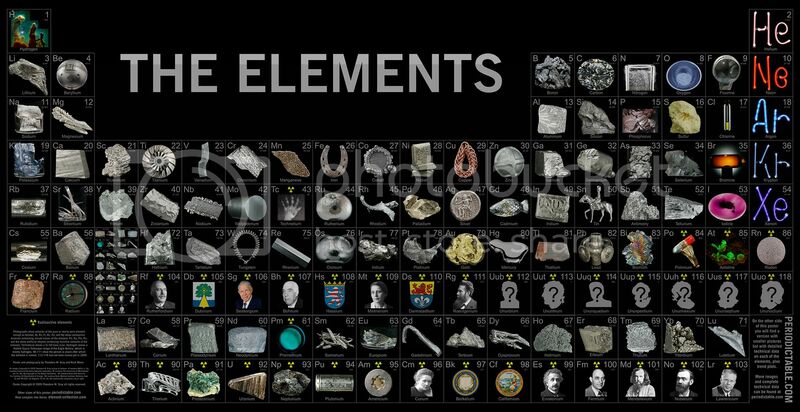 It is, of course, the periodic table of the elements. There is an immense challenge in taking such a well-known, immutable scientific entity and making people see it in a way it has never been seen before. And to do so using photography and creative writing? To the moon, Alice! Yet in Theo Gray’s gorgeous new book The Elements, this is precisely what occurs—a rebirth for ruthenium, rhodium, radium, rubidium… and the rest. Each page (as seen below) is elegantly laid out with gallery quality photography, sometimes of compounds, minerals and applications that would surprise you, and fascinating stories that turn each element into its own unique chapter in the hallowed Bible of chemical history. 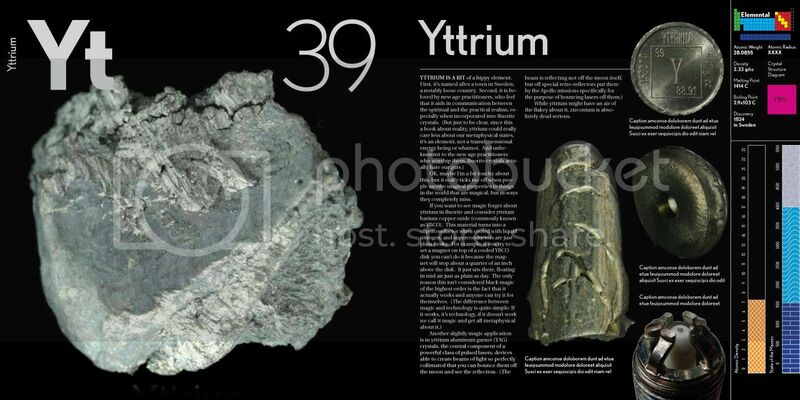 Element #39, and The ScriptPhD's favorite... Yttrium! Useful for superconductors, spark plugs, hippies that believe it has telekinetic communication powers, and let's face it, the coolest name in the periodic table! What is most unique and attractive about The Elements is the lengths to which it goes to envelop artists and creatives in the world of science, many of whom would be surprised how much of their craft they owe to chemistry. Iconic photographers like Ansel Adams would be nothing without magnesium, which has been widely used in camera flashes to provide light. For you font and graphic design nerds out there, one thing the typeface documentary Helvetica omitted is the magic that lies in the combination of antimony, lead and tin—it expands when solidified from a molten state. Voila! 650 years (and counting) of movable typeface. Film buffs who have enjoyed movies like Avatar (and the upcoming Hubble 3D) on IMAX would be interested to know that IMAX projectors use 15 kW short-arc Xenon projector lamps. Jimmy Hendrix, Stevie Ray Vaughan, Eric Clapton, ZZ Top, BB King, and countless other guitar legends would be silenced were it not for the obscure element samarium, which in combination with cobalt is used as a magnet for electric guitar pickups. And for all of you DJs and musical purists who agree with The ScriptPhD that no musical sound is sweeter and sharper than that of a vinyl record, did you know that phonograph needle tips are made of osmium? 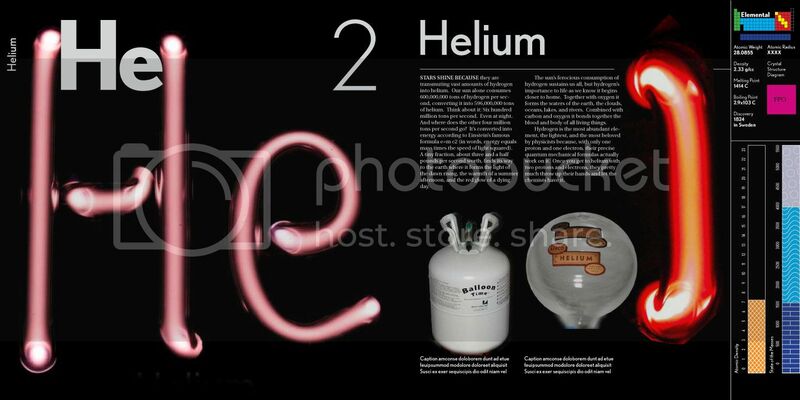 Element #2, Helium, named after the Greek God Helios. Helpful for neon lasers, floaty party balloons, and covering Alvin and the Chipmunks. 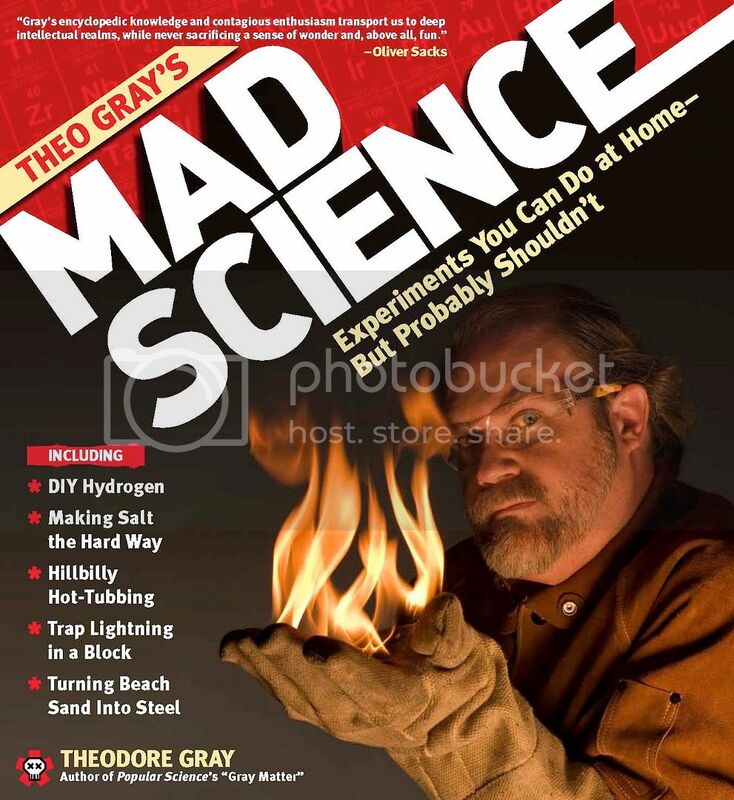 Author, Popular Science columnist and element collector/photographer Theo Gray. Image courtesy of TheoGray.com. ScriptPhD.com Editor Jovana Grbic was fortunate to chat with Theo Gray recently, and was eager to get his perspective on the making of The Elements and Mad Science books, and some more meaty science policy issues as well. ScriptPhD.com: Tell me a bit about the idea to put together The Elements. Theo Gray: The book goes back quite a ways. I started collecting elements, really by accident, in 2002. We needed a table for the common area of the office I was moving into, and I didn’t want some kind of an ugly thing that you could get from an office supply catalog, so I had tables on my mind. Then, I was reading Uncle Tungsten by Oliver Sachs, and he describes a periodic table that he used to visit at the science museum. I took that literally, and thought the table literally looked like a table, and that seemed like the coolest thing—someone should make a periodic table [with slots for the elements], and at that point no one ever had! Because of the way the table was designed, it was easy to make little compartments underneath each element where you could put a sample of the element. This was right around when eBay was exploding, and it turned out you could get a great many elements there. It kind of happened by accident. One table led to another, and pretty soon, I had thousands of element [samples], pure and industrial compounds. Then I started photographing them to remember what they are. 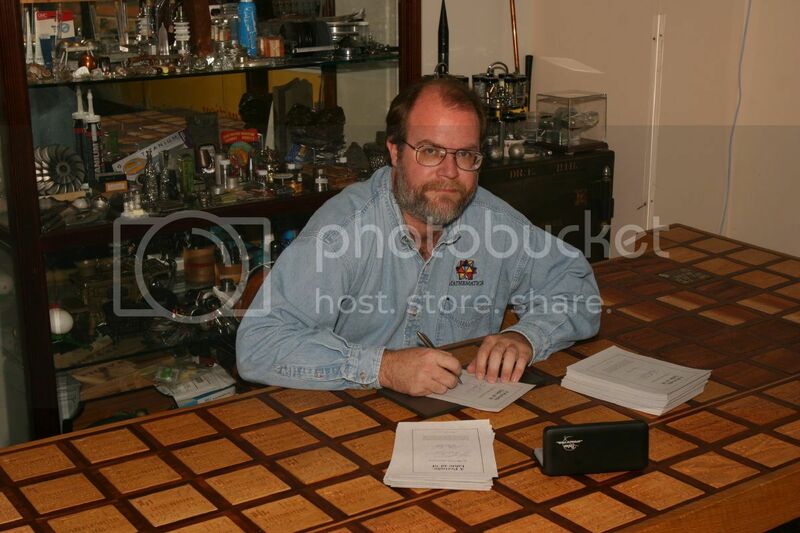 I put the cataloged list and accompanying photographs on the web, and people liked it, and the Ig Nobel Award I got in 2002 made me think that this is something other people might be interested in, too. One thing led to another, and the cameras started getting fancier, and the photography started getting better, and pretty soon I thought I could make a poster [of the elements]. This poster is now seem on TV shows from MythBusters to Hannah Montana, which eventually led to The Elements. 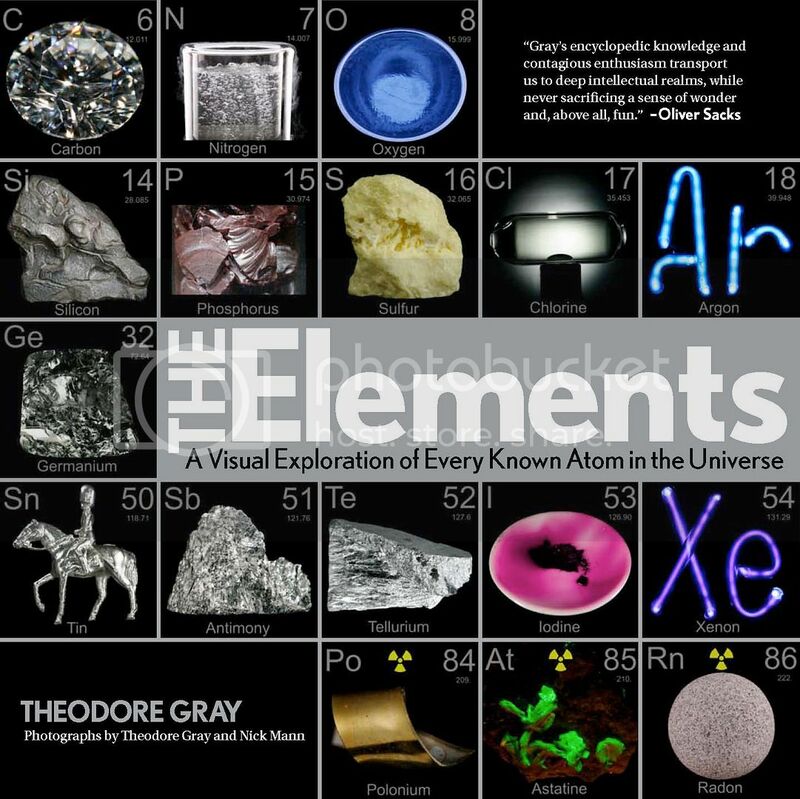 The Elements poster by Theo Gray. The ScriptPhD proudly owns a copy, so get yours today! SPhD: One of the things I really loved about The Elements was the humor interspersed throughout the copy. You manage to really make it fun, lively and at times hilarious. Was this writing style meant to parallel how you view science, and chemistry in particular? SPhD: What were the biggest challenges during the making of the book and photography of the elements? TG: In terms of the writing of the book, the rare earths, or Lanthanide series, was the toughest by far, because all of the Lanthanides are very similar [in chemical property]. In many cases, for commercial applications, they’re essentially interchangeable. If you’re making lighter flicks, it really doesn’t matter what rare earth you’re using—and they don’t even purify them, they just take them out of the ground. And many of them don’t really have any interesting applications. Although, it was interesting to discover Thulium (Tm 69), for example, which I’d gone for years thinking that no one actually cared about. But it turns out in the lighting industry they care passionately about thulium, and they couldn’t live without it [for metal halide lamps]. The challenge with the photography is that these are all essentially lumps of gray metal. 90%+ of all the elements are gray metals and shapeless. One of the few other photo periodic tables out there was published in the 1960s by Time-LIFE, and they all look the same—not very interesting! Our job was exactly like the job of a commercial photographer, an advertising photographer. They’re given a product that might be the most boring thing you ever saw, and they have to bring out its inner beauty by way of lighting and arrangement. We tried to think of the most exciting examples of each metal. We also did cheat a bit, with some of the beautiful, colorful crystals, which are not pure elements but rather compounds. But it is an excuse to put a splash of color on every page! 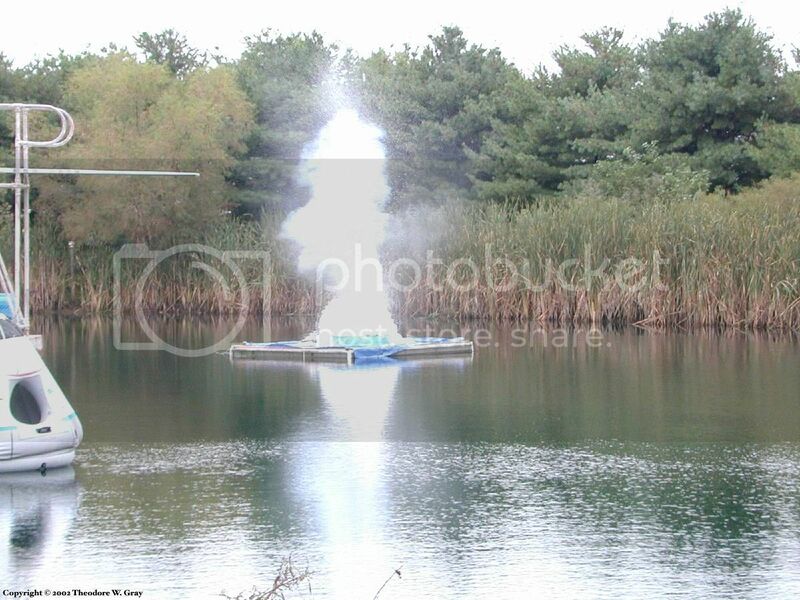 Sodium + Water = BOOM! Courtesy of www.TheoGray.com. SPhD: You know I’m going to ask… you’re the Element King… What’s your favorite element and why? TG: Ahh, the favorite element question! My first answer is that I don’t have a favorite child, either. But there’s different elements that I like for different reasons. Sodium, for example, if you have a lake near-by, is the element you want to have. [Editor’s note: BE CAREFUL! HIGHLY EXPLOSIVE!] On the other hand, something like titanium is a wonderful metal in every way—it doesn’t rust, it’s malleable, highly useful, strong, and many of its applications are interesting and exotic. Copper is so great as well, because it’s the only colored metal that is reasonably priced and not explosive. Cesium explodes, and gold is very expensive. That leaves copper, but people don’t tend to make sophisticated shapes out of it other than jewelry. But if I had to name two, it would be sodium and titanium. SPhD: Let’s talk about your other book for a moment, Mad Science. Some of my favorite experiments that I want to replicate are the lightbulb, homemade pencils, 1-volt liquid battery (which I’ll use to charge up my iPod), plating the iPod, and my personal favorite, preserving a snowflake. Was there an experiment in this book that made it in or didn’t where you either felt like your life was in danger or you were like, “OK, change of plans, we’re not doing this.”? TG: I have a policy of not doing anything dangerous. These experiments [from the book] are only dangerous if you don’t do them right, which I explain fairly well in the safety section. Because basically, I’m a complete ninny. I’m terrified of that stuff, which is the way that you ought to be. There is a good bit of thought that went into the worst case scenario, and if there was a shred of doubt, we rethought the experiment—smaller scale, or do it differently. One of the advantages of doing it for photography as opposed to in person is that we were able to get away with extremely small quantities. We also hired specialists where applicable, such as an electrical engineer for shrinking coin trick, or an industrial chemist for the chlorine experiment. The one experiment that I suggest your readers do is the snowflake one, which is just so nice, and only took me three or four tries. The key is to keep your slide really cold and pre-cooled, and to handle them with your hands the least amount possible. SPhD: You are, of course, most well known for your Popular Science column Gray Matter. How has writing Gray Matter, particularly focused for a lay audience, changed your role in science? TG: It’s interesting to be faced with the challenge of trying to explain something that is actually quite complicated and deep in a format where you only have a few hundred words and you can’t assume that your audience has four semesters of college chemistry. If I were writing for Scientific American, it would be quite different and you could use a certain shorthand quite freely. Here, I have not not only explain everything, but also make it fun and entertaining. The most important thing is that I have an opportunity to speak to people, particularly young people, who probably aren’t getting any actual science anywhere else. Rather than preaching to the choir about the value and interestingness of science, I can reach out to a new audience. Often in lay magazines, it’s frustrating to read so much pseudo-science because the people doing it don’t actually know what they’re talking about. The other thing I like to do is scatter some breadcrumbs throughout my writing to leave hints or terms that can’t really be explained to encourage people to look things up on their own. SPhD: So much of our modern culture is influenced by the growth of technology and science, which play a huge role in our lives and economy than ever before. And yet, as a whole, mainstream public knowledge of basic science can be shockingly absent or misinformed. What is the single most important thing people like you, myself and others in the science community can do to mitigate this? TG: There’s a couple of things. One is, and I’ve written a couple of blog posts about this for Powell’s Books, that you need to be relatively fearless in getting out there and telling the truth without worrying about repercussions or consequences. I’m talking about things like creationism or homeopathy, which are two basically stupid ideas which are very widely believed. People like me have a responsibility not to beat around the bush [as to their accuracy or lack thereof]. One needs to have strong attitudes because that’s what gets people riled up. At the same time, one needs to communicate that science is something that is worth putting effort into and learning about, because it’s very powerful. If you understand it, and your competitor doesn’t, you win, in many, many situations. We see this both in technology and at the societal level, one that we’re frankly losing to China. While we’re arguing about evolution and homeopathy, they’re gathering all the natural resources they can to become the dominant global economy next Century. SPhD: You are one of the few scientists that have crossed the barrier to entertainment and wider popular appeal. Why do you think more academics have not? Is it a problem of the public welcoming these figures, hesitation in the academic community of going mainstream, or something in the middle? TG: It depends. There’s different motivations. I, for example, grew up in an entirely academic household; both of my parents were math professors. I completely understand that world and that mindset. The kind of articles that I write for Popular Science would be considered more than a little bit embarrassing if I were an academic and had to worry about tenure committees and citations of academic papers. It’s not a very respectable profession, from an academic point of view, and I think that keeps a lot of people out who could write for a broader popular audience. It’s also a quite different skill, one that’s taken me decades, to develop the writing style that works for a lay audience—and it’s not easy to do. And then on the other side, there’s a resistance among the publishers and media types to take science seriously because they assume it’s going to be boring. It irritates me greatly when TV shows about science end up being frantically edited, with lots of flashy graphics going up. And you can just tell that what happened was that none of the people involved knew anything about science (or possibly cared). But if you look at a show like MythBusters, for example, it’s a fantastic science show. SPhD: Yes! We love MythBusters! TG: They are one of the most successful of all cable shows, and they are 95% a science show wrapped up around the theme of a “myth” that they have to “bust.” Fundamentally, what they do is pose a question and then hypothesize and answer it using the scientific method. I don’t know if people appreciate how revolutionary it is for them to do that consistently. SPhD: This is why ScriptPhD.com loves The Discovery Channel and MythBusters so much. We are in contact with them, we’re big supporters, and we wish them, and you, a lot of luck with shepherding the next generation of curious young scientists! TG: Delightful to talk to you as well. Thanks!